Collectors and fans will have the opportunity to own a piece of the music icon’s celebrated life, both personal and professional. Amongst the extraordinary is the Elvis Presley TCB Tour Bus, Elvis’ “Jailhouse Rock” personnel forms and even his personal Stutz Blackhawk vehicle. 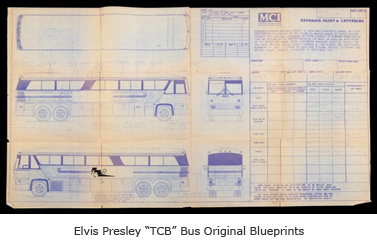 Original blueprints of the TCB Tour bus are also included in the highly anticipated auction. The 1976 MCI Crusader Bus was originally purchased with funds provided by Elvis Presley for his supporting singers, The TBC Band, which was led by early musical influence and dear friend J.D. Sumner. 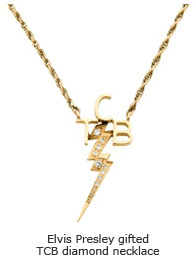 The bus was custom designed and adorned inside and out with the TCB (“Taking Care of Business”) lightning bolt logo which was Elvis’ personal motto. It has nine sleeping berths, seats twelve and the distinction of being driven by Elvis himself. Accompanying the bus are copies of the original $25,000 check provided by Elvis to cover the down payment on the bus. A video tour of the “TCB” bus hosted by Martin Nolan, Executive Director of Julien’s Auctions can be seen here: https://www.youtube.com/watch?v=ArhNTl4-AfE. Elvis Presley would have turned 80 years old this year. The “TCB” tour bus is only one of the truly iconic pieces of Elvis memorabilia being offered during Music Icons by Julien’s Auctions. 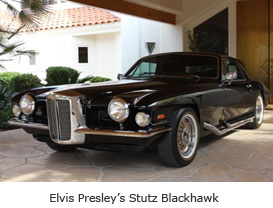 Among the amazing collection is also Elvis’ second Stutz Blackhawk production model vehicle which he purchased on September 8, 1971. The 1971 model is a two-seater with a small jump seat. The car was delivered to Elvis on September 9, 1971 at his Monavale Street home in Beverly Hills. At the time, the Stutz Blackhawk featured the best audio system money could buy. And Elvis’ black and white Penguin suit worn in Las Vegas in which he was photographed (Estimate: $60,000-$80,000), Elvis’ first live performance worn stage shirt from 1954 (Estimate: $25,000-$35,000) and the 1967 Elvis and Priscilla Presley Marriage Certificate (Estimate: $25,000-$35,000) add to the excitement of this unprecedented tribute to the King himself. Among the other highlights of The Collection of Elvis Presley is an Elvis Presley Signed Louisiana Hayride Contract (Estimate: $30,000-$50,000). 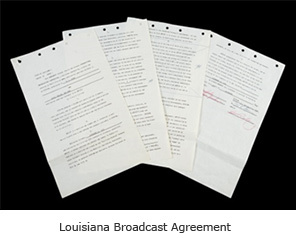 The four page executed contract between Elvis Presley and International Broadcasting Association was signed on September 8, 1955 and was only the second performance contract Presley signed in his career at that time. Also included is a group of six Elvis Presley Circle G Ranch related photographs (Estimate: $100-$200) including one original vintage image of one of Elvis' vehicles parked in front of the Wedding Cottage located on the property. Elvis Presley’s “Jailhouse Rock” Personnel form is a stand-out amidst the collection. The signed Lowe’s Incorporated MGM Pictures personnel record document dated May 14, 1957 includes Elvis’ personal information including address, emergency contact, social security and employee number. In 1957 Presley made the film with Avon Productions. The form is signed by Presley. Elvis Presley’s Military Winter Dress Uniform seen photographed in 1959 is also included and is estimated at $20,000-$40,000, as is the iconic Elvis Presley Black Gibson J-200 Guitar that he played at the Las Vegas Hilton (Estimate: $50,000-$70,000). 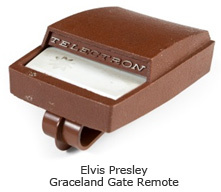 More highlights of Property From The Life & Career of Elvis Presley include a group of 25 Elvis Presley publicity images from his career in film (Estimate: $200-$400), an Elvis Presley Gifted TLC diamond necklace that he gave to his nurse Letetia Henley Kirk (Estimate: $8,000-$10,000), an Elvis Presley EP Circle “G” Ranch Sign from Presley’s Circle “G” Ranch in Horn Lake, Mississippi (Estimate: $1,600-$1,800), an Elvis Presley prescription box affixed with typed prescription label (Estimate: $1,000-$2,000), an Elvis Presley signed and inscribed copy of “The Prophet” (Estimate: $2,000-$4,000), an Elvis Presley Graceland Gate Remote (Estimate: $4,000-$6,000), an Elvis Presley white knit cardigan worn early in his career (Estimate: $6,000-$8,000), an Elvis Presley 14K gold nugget pendant (Estimate: $8,000-$10,000), an Elvis Presley Donnegal PG Medicine Bottle dated 1974 (Estimate: $2,500-$3,000), an Elvis Presley signed cut sheet (Estimate: $800-$1,000) and Elvis Presley’s wooden praying hands (Estimate: $3,500-$4,500) and much more. Few would deny the fact that Elvis Presley wrote the book on rock n’ roll stardom. From his leather pants to his private jets, he laid the groundwork for rock stars to come. When “That’s All Right” became a hit in 1954, Elvis gave mobs of fans a chance to scream and a reason for pop stars of the future to follow his lead. His Southern charm, handsome good looks and ability to sing one note and make woman of all ages swoon was only part of Presley’s appeal. Elvis influenced everyone then and still does. His influence is everywhere, reserving his permanent place among the most sensational pop culture icons of our time. 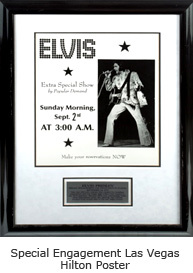 The Collection of Elvis Presley auction will take place on Saturday, May 16, 2015 during the Julien's Auction's highly anticipated Music Icons Auction Event held at Hard Rock Cafe New York. With expertise specializing in entertainment and sports memorabilia, Julien’s Auctions has quickly established itself as the premier auction house in high profile celebrity and entertainment auctions. Julien’s Auctions presents exciting, professionally managed and extremely successful auctions with full color high quality auction catalogs unlike any other auction company. Previous auctions include the collections of Cher, U2, Barbra Streisand, the estate of Marilyn Monroe and many more. Official website is www.juliensauctions.com. With a total of 198 venues in 63 countries, including 152 cafés, 21 hotels and 10 casinos, Hard Rock International (HRI) is one of the most globally recognized companies. Beginning with an Eric Clapton guitar, Hard Rock owns the world's greatest collection of music memorabilia, which is displayed at its locations around the globe. Hard Rock is also known for its collectible fashion and music-related merchandise, Hard Rock Live performance venues and an award-winning website. HRI owns the global trademark for all Hard Rock brands. The company owns, operates and franchises Cafés in iconic cities including London, New York, San Francisco, Sydney and Dubai. HRI also owns, licenses and/or manages hotel/casino properties worldwide. Destinations include the company's two most successful Hotel and Casino properties in Tampa and Hollywood, Fl., both owned and operated by HRI parent company The Seminole Tribe of Florida, as well as other exciting locations including Bali, Chicago, Cancun, Ibiza, Las Vegas, Macau and San Diego. Upcoming new Hard Rock Cafe locations include San Juan, Rio de Janeiro and Marrakech. New Hard Rock Hotel projects include Daytona Beach, Dubai, Los Cabos, Dallas-Fort Worth, Tenerife, Abu Dhabi, and Shenzhen and Haikou in China. For more information on Hard Rock International, visit www.hardrock.com.